Diamond is always more valuable than other stones. So in search of cheaper alternatives appeared a lot of simulations: cubic Zirconia, rhinestone, moissanite, sapphire, etc. it is usually difficult to understand where the real diamond, and it cheap fake. However, there are several simple ways that will help to dispel or, alternatively, confirm your doubts about the authenticity of a diamond. Reliable conclusion about the authenticity of the diamond can give the expert laboratory that conducts comprehensive diagnosis of the properties of precious stones. 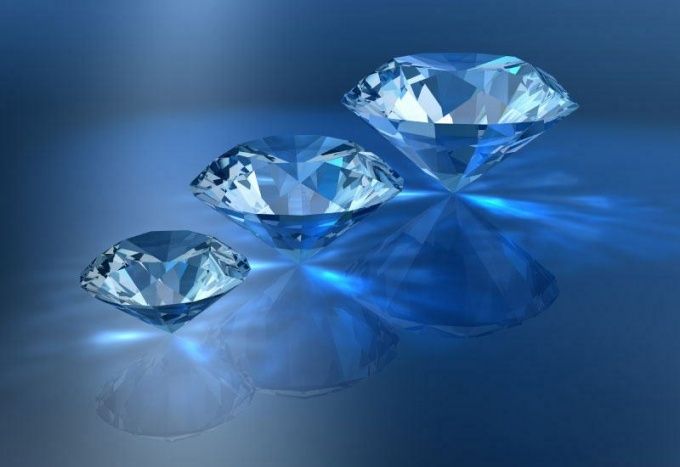 Specialists-gemologists to evaluate the diamond in terms of color, clarity, cut quality, thermal conductivity, fluorescence. In the case of the studied stone is indeed a diamond, it's attached to an expert opinion. This document, the owner of the diamond can retain as proof of its authenticity. In many cities there is still no Gemological laboratories, but to obtain at least minimal information about the authenticity of a diamond it is possible at home. With a magnifying glass look carefully at the jewelry: real diamond, often embodied in the product so that it is easily viewed at the bottom face. In addition, on the lower faces of the diamond under any circumstances you will not see the mirror coating. Otherwise, the stone is a fake. Examine the appearance of the stone for any visible chips, pitted faces, the presence of internal inclusions. The diamond is the smallest allowable inclusions, all faces and edges should be smooth, clear, no chips or rough edges. Please note the stone's sparkle. Diamonds shimmer in all the shades of gray, whereas rainbow glitter should give you an idea about fake. One of the unique properties of diamond is its high thermal conductivity. Breathe on the stone and immediately examine through a magnifying glass its surface. On the imitations of diamond (glass, quartz, zircon) remain vague traces of a genuine diamond of such traces should not be. If the counterfeit is of low quality, it is easy to determine by rubbing the stone with sandpaper. Due to the unique hardness of this diamond from this contact will not be over. Similar way of testing – a stone to scratch the glass surface. A fake will not be able to leave her scratches, while diamond can handle this easily. Loose diamonds, place on a sheet of paper with printed text. Through glass or crystal you can clearly see the letters, and the refraction of light diamond of the text will be indistinguishable. Another similar method: direct a beam of light from a small led light on the stone. If, looking from the opposite side, you will not detect the light beam, and instead will notice a light outline around the edge of the stone, then you have a genuine diamond. Check for conductivity excellent resistance to such a simulated diamond like moissanite. It is not recommended to determine the authenticity of a diamond by using a variety of scratching surfaces, because even a genuine stone can get damaged. When you purchase jewelry or loose diamonds please note the cost of the acquisition. Suspiciously low price – an occasion to reflect on the authenticity of the proposed stone. Diamond, in French means "brilliant", many it and indulge in its brilliance and sophistication, but all this is inherent in only genuine stone. To determine the authenticity of a diamondto a greater extent, can only specialist. But it is not always possible to consult a Pro. There are several ways to test a diamond at home. These tips will help you to distinguish between a blatant copy and the original. Prepare carefully obsmotret the diamond from all sides, carefully considering his unique ability to light refraction. 1) Stone, which is not enclosed in a frame, you can put on a sheet of newspaper or magazine, it does not matter, the main thing that there was a text. If using stone visible letters, and moreover, they increase in size is a fake. The real diamond does not allow to see any numbers, or letters, and certainly will not work as a magnifying glass. 2) Shine a flashlight on the stone, you can also check it for authenticity. A real diamond does not let light through, and the only bright area around say about the genuineness of the diamond. 3) verify the diamond you breathed on him if he stays clean and transparent, then you have a genuine stone because diamonds are excellent conductors of heat. But glass, quartz and other, instantly covered in fog. But keep in mind that there is a stone called massanet, which is likely to steadfastly endure the test. 4) after Examining closer the true diamond can be found on the surface of different inclusions, very tiny, other minerals, which formed as a result of its formation. However, the bubbles do not belong to it, they can only be on the fake stones. (5) In this diamond cannot be worn edges or rounded edges. 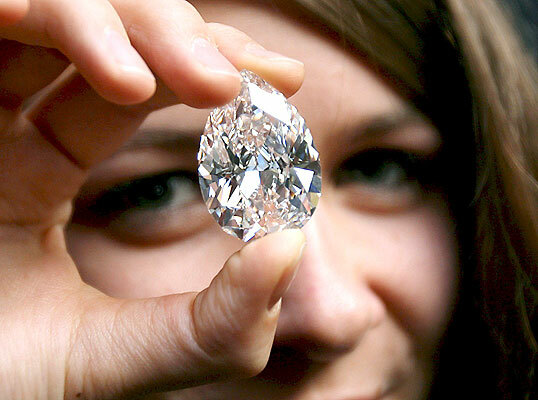 6) Buying a cheap "diamond" know for sure – before you fake clean water, because a real diamond is worth a lot of money. 7) If You purchase the product with a diamond, note that the back side is open, in order to be able to view the stone from all sides, and it should not be mirrored. 8) Despite the overstrength of the diamond can easily scratch a piece of metal or glass, so it is better not to use such a method of verification. 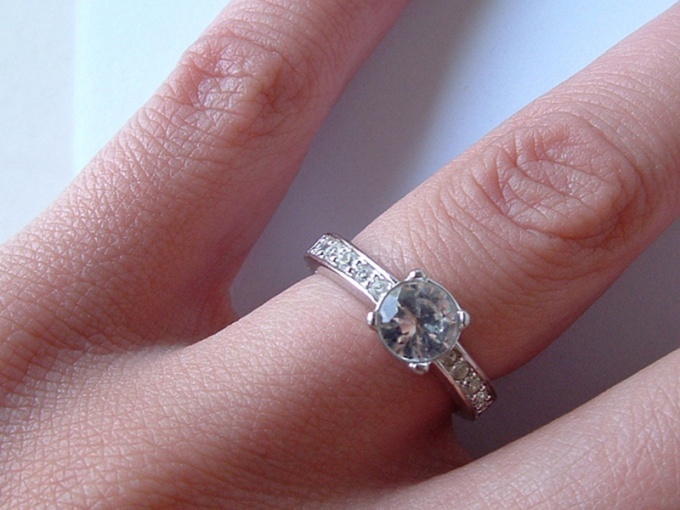 9) There is a misconception that the diamond should sparkle with different colors. All shades of gray – that attests to the authenticity of the diamond. 10) by Placing a diamond into the water, You will be able to determine if your stone from a combination of true and false material, too practiced. In the water you will see the junction if it occurs. The diamond is a symbol of success, luxury and well-being. These precious stones jewelers adorn many expensive jewelry: bracelets, pendants, chains, watches, earrings, etc. Gift a diamond can surprise any person, special girl. But, unfortunately, it often happens that the diamonds are fake. And not always on the eyes to determine their authenticity. Very high-quality forgery can only be discerned by professional gemologist (jeweler). As a rule, to the naked eye, without special tools it is almost impossible. But you can detect obvious forgery you can own, knowing a few proven techniques. To determine the authenticity of the stone you will need newspaper or any printed text on paper, a small flashlight with a bright beam of light and a container of clean water. If the diamond you buy is not cut, then put it on the printed text and see what you can see through it. The fact that the real stone is very strongly refracts the light and you will not be able to distinguish the printed text, that is all very vague. Using fake stone letters are well mapped. Also you can check the refraction of real stone with light. Take a small flashlight and point it at the stone that the beam passed through him. If you do not see light on the other side of the stone, the diamond is likely real. Light, due to refraction, should dissipate. Try to get some on the test stone. Since diamond conducts heat superbly, you will not be able to see it obscured the trail. But not only a diamond is capable of good thermal conductivity, so this check stone better to do with your jeweler. Now inspect your diamond on the edge. There are natural diamonds and artificially grown. Artificial gemstones are usually much cleaner than the real thing. In the water they will be almost transparent. Real, mined from the earth, on the contrary, will have various small inclusions. But not bubbles, as the air in the stone, evidence of apparent forgery. Despite the fact that diamonds are the hardest substance on Earth, they better not cut the glass in order to authenticate. This can significantly damage the stone. Please note the price of the jewelry. A real gem can't be cheap. Many owners of expensive jewelry turn to professionals to find out the genuine diamonds that they have. However, to answer this question by yourself. You need to do some fairly simple experiments. One of the simplest ways to check the authenticity of a diamond lies in the definition of its reaction to moisture. Hold the diamond to your mouth and slowly exhale it. If you notice that the stone fog up for a few seconds, most likely a fake diamond. A genuine diamond has the ability to dissipate heat instantly, so blurred it is almost imperceptible. If you'll see this blurred, it disappears much faster than fake diamonds. In addition, if you repeat this experiment several times, on a real diamond, the result is always the same. Fake stone with each new approach will moisten all the more, it produces condensate. If you check the authenticity of a diamond on jewelry, pay attention to the metal into which it is placed. Earrings, rings and other jewelry with a real diamond is likely to be made of gold, silver or other valuable metal. Armed with a magnifying glass and check the product for presence of a mark on the sample. 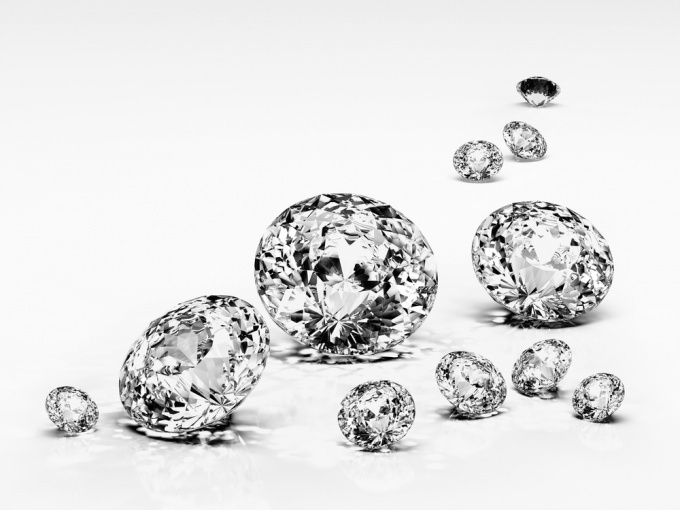 If available, the probability that a diamond is genuine is very high. At the same time, you may find the inscription CZ (cubic Zirconia), which means that the diamond is of synthetic origin. Real diamonds usually have an ideal composition. Look closely at it with a magnifying glass. If you see specks of extraneous minerals or small color changes, the probability that a real diamond is very high. Synthetic diamonds are grown in the laboratory, they do not have these defects, because are made in a sterile clean. However, the absence or presence of such defects can not be the determining factor. Even real diamonds can be perfectly clean. Be sure to conduct additional research. If you have a fairly large stone, you can determine its authenticity by checking its refraction. Pick up a newspaper and look at it through the diamond. If you will be able to read printed text, or at least see him with the big distortions, to be sure, this is a fake diamond. Genuine diamond very strongly refracts the light, so to see anything specific for him is almost impossible, unless prepared in a special way. Real diamond is a very hard material, it is quite difficult to break. Heat the stone using a small fire for 30 to 40 seconds, then quickly dip it in a glass of cold water. If the stone is made of glass or quartz, it is quickly covered with cracks.